Since the late 1960's the State of Kuwait has taken giant steps in urban development. The progress during the last four decades has been steady and rapid in all areas of the construction industry. COPRI Construction Enterprises w.l.l., founded in 1969, is proud to have taken part as a main contractor for roads & buildings in this extensive development. Copri has established itself as a leader in the contracting field, successfully executing over 350 projects to date. Achieving client total satisfaction through a dynamic, proud and experienced team of professionals commited to excellence. To master the "Art of Construction" project after project. Our work should become a quality reference and guide to others. Pride, Professionalism, Hard Work and Creativity; without such values we become just another substandard contractor. KD 2,000,000 (US$ 6,780,000) Fully Paid. 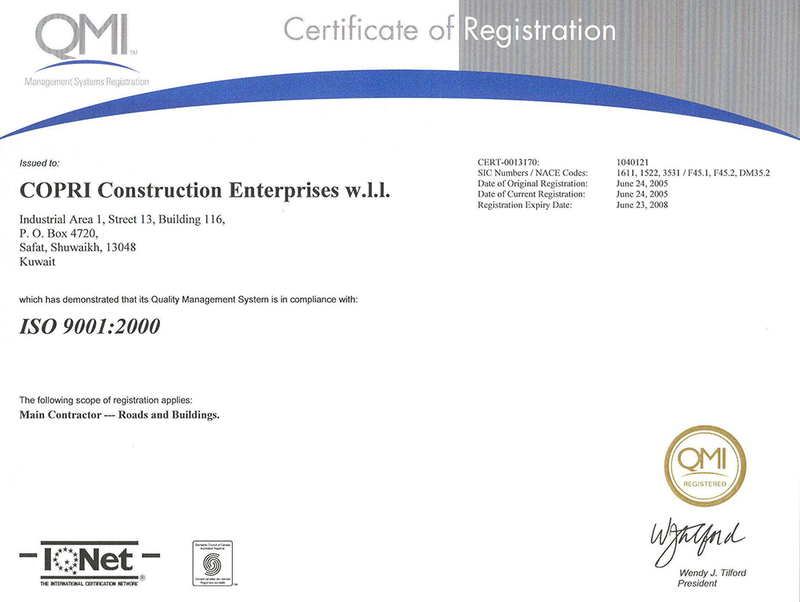 Certification: COPRI is committed to both quality and efficiency in its work, always improving to become more competitive and to guarantee customer satisfaction. 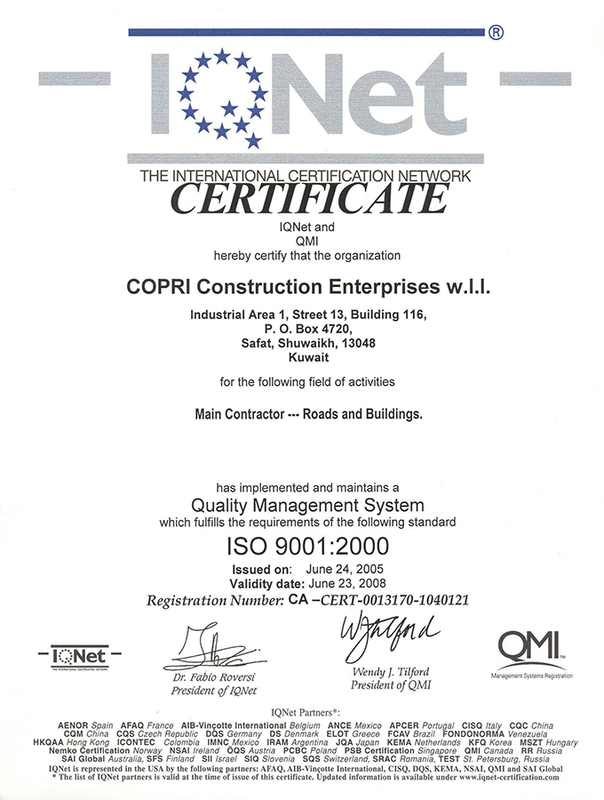 Copri is an ISO certified company, adhering to international standards and specifications. If you're interested in joining our team, fill in this form. We'll contact you as soon as there's an opening. Qibla, Block 13, Fahed Al Salem St., Plot 28, Kuwait. P.O. Box 4720, Safat 13048, Kuwait. (+965) 224 00 383 - +(965) 224 00 126/7.